What is it about the Holidays that makes indulgence not only acceptable, but a given? From elaborate events to lavish presents to sumptuous food, it’s all perfectly permissible. Perhaps that’s why some of the richest desserts are during this season. Cooks create whatever tastes good and put off any calorie concerns until January. At least that’s what I’m doing for this week’s recipe. You see I wanted to make something with pears. Left in the shadows of pumpkin and apple at Thanksgiving only to be pushed aside for gingerbread, peppermint, and eggnog at Christmas, pears don’t get their props. My search took me outside Pinterest, to Google. 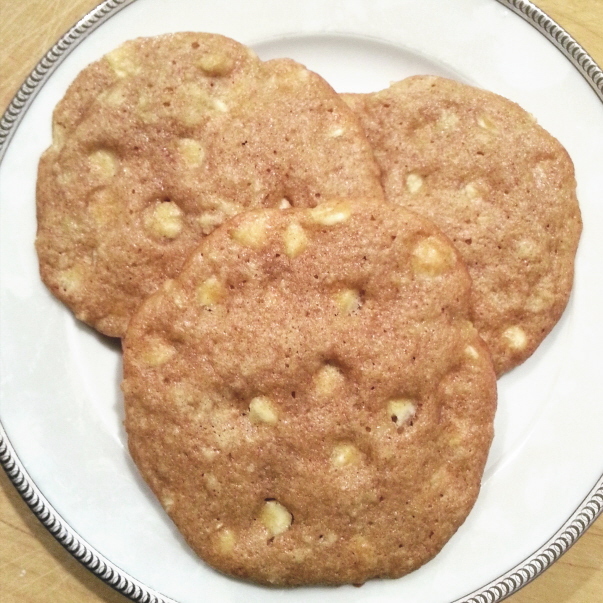 That’s when I found it – Brown Butter White Chocolate Pear Cookies. I couldn’t have asked for better. Spiced cookies with fresh chopped pears, and white chocolate chips. I knew the browned butter was an additional step, and I’d have to chill the dough for at least two hours. Even so, I figured the recipe would be worth it with a couple changes. I chose dark brown sugar in the cookies instead of light brown as listed. Since I didn’t have the optional Praline Liqueur, the extra molasses in darker sugar would create deeper caramel notes. I also added 1 tsp of dark brown sugar to the pear mixture in lieu of the liqueur. I substituted Bartlett pears for Bosc, as I already had them on hand. I used two due to their baby size. The author specifically indicated Ghirardelli for the white chocolate chips. However, if you read their label carefully, it doesn’t say chocolate because it has no cocoa butter. Real chocolate makes a difference, so I used Trader Joe’s White Chocolate Baking Chips. I followed my standard cookie guidelines, and reduced the oven temperature to 300 degrees. Baking time was 18 minutes, followed by 3 minutes of rest on the cookie sheet before moving to the cooling rack. 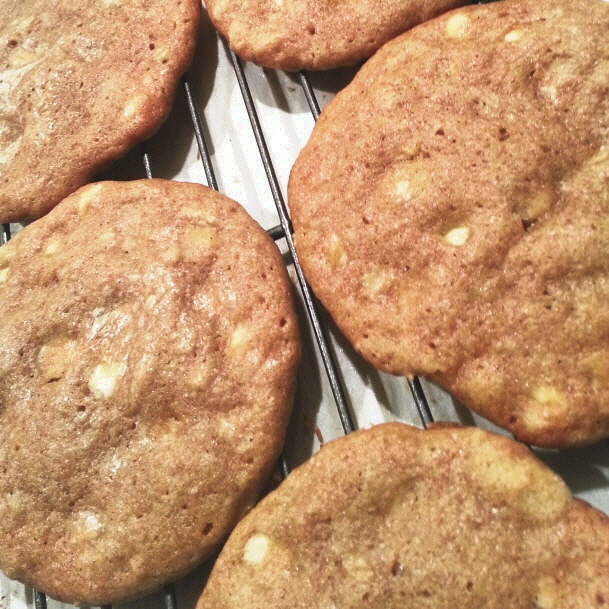 To be honest, making these White Chocolate Pear Cookies proved to be more laborious than anticipated. There was the pear mixture, browning the butter, solidifying the browned butter, combining the dry ingredients, blending the wet ingredients, and then stirring everything together so you could chill the dough. Not to mention the little tastings between steps to make sure I was on the right track. By the time I put the dough in the fridge, I needed the break. About three hours later, I put my first batch of cookies in the oven. Though stickiness made it challenging, I flattened each scoop of dough like the author advised. The result, 12 merged cookies. Admittedly I was disappointed in the appearance. But this effort had become an event, and I was anxious to try the finished product. Still warm, the cookies were super soft and barely held their structure. My first nibble was sweet with a mild spice and buttery richness. White chocolate chips filled every bite. Their smooth flavor added another nuance. Most of the pears were diced so fine; they were almost indiscernible from the baked dough. Hence I can’t say I actually tasted the pears, rather its influence. The cookies were incredibly moist. Maybe the other pear also explained their flat shape. For the second batch, I kept it to six scoops of dough. This worked flawlessly, yielding large cookies with slight, crispy edges and chewy centers. So I baked the last batch the same way. I don’t know how many cookies I had that night. Really, I lost count. But it’s the Holidays, so does it even matter? I give these Brown Butter White Chocolate Chip Cookies 4.5 out of 5 stars. It’s too much work for a perfect rating. Nevertheless, I’d do it all again for such cookie contentment. For the full recipe, please visit The Baked Equation. Thank you for taking time to review my recipe. My pleasure, Melissa. I’m so glad I found your recipe. Truly one of the best cookies I’ve ever had.